Celtic are strong favourites, but Rangers have shown they have what it takes to win Sunday's League Cup semi-final according to Lee McCulloch. The Scottish Championship side have knocked three top-flight sides out of cup competitions this season. "They weren't easy games, but the way we played gives us confidence," the Rangers captain told BBC Scotland. "Against Kilmarnock, I thought we were brilliant - the way we pressed them and made them make mistakes." Premiership sides Inverness Caledonian Thistle and St Johnstone have also lost to a Rangers team whose indifferent league form has left them trailing leaders Hearts by 13 points. It is the first meeting between the Glasgow rivals for nearly three years since financial problems led to the Ibrox outfit playing in Scotland's bottom tier. But McCulloch rejects the suggestion that Premiership players play at a quicker pace and have greater fitness than those in the Championship, thus handing Celtic an advantage on top of the quality that led them to the Scottish title. "Obviously Celtic for this one are resounding favourites, so we are just looking to give a good account of ourselves and hopefully get through to the final," said the 36-year-old former Motherwell and Wigan Athletic striker who now plays in defence. "Form goes out of the window as this is a one-off. "It's up to us to try to prove people wrong about their opinion and persona of where we're at just now and show we have got character in the dressing-room and that we have got leaders that can lead a dressing-room to an Old Firm victory. "Out last two games have been called off. There is a danger we could be rusty, but I think the boys will be ready after a hard week's training." Rangers go into the game with a backdrop of boardroom battles and emergency loans being required to keep the club from going out of business. "You need to cut yourself off from anything that happens off the pitch and focus on our goal of getting the club up to the top league," stressed McCulloch. "It will be a great experience for the players who have not played in one before." 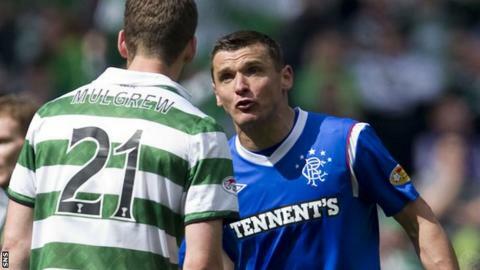 McCulloch, who says victory would be so much sweeter as he is also a Rangers fan, is a veteran of Old Firm derbies and fondly remembers his first - a 3-0 win at Ibrox in October 2007. "I will never forget walking down the tunnel and the place was bouncing," he said. "Hampden is a different kind of atmosphere to Celtic Park and Ibrox. The fans are a wee bit further away, but it will still be noisy. "It is a semi-final and there's a place in the final up for grabs, but we will approach it the way we always have. "It is just another Old Firm game and everyone knows the consequences if you get beat. "I love them and they are even better afterwards if you win and I've been under my bed for a few days after a defeat."